The Client Area add-on provides an easy way to create a client or member area where users can upload files that stay private. Using a shortcode, the interface can be placed in posts or pages and all controls are accessible from the front-end. Users can create folders, browse through the folder structure and delete existing folders and files. 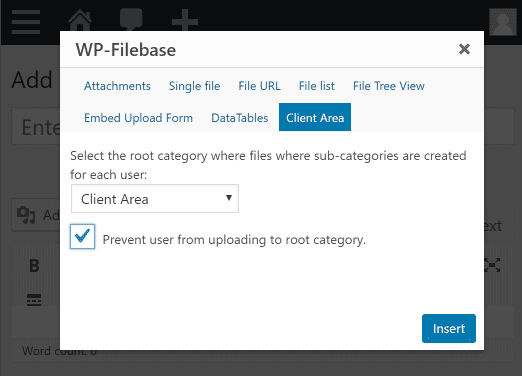 A category is automatically created for each uploading user, which can be considered as a home folder. An online print shop allows their clients to upload documents to their account. These uploads must not be accessible by other users except the administrator. Clients can create sub-categories (e.g. folders) for their projects or print jobs. 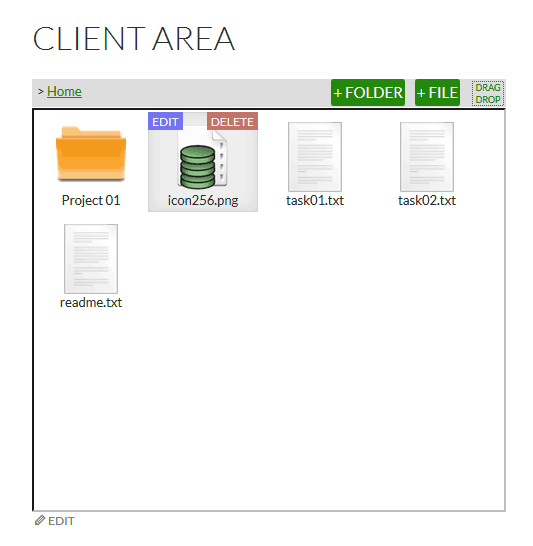 The Client Area provides a front-end interface supporting drag&drop, multi-uploads, editing and deleting files and categories. See interface is kept as simple as possible. For a demonstration follow the demo link. Each user has their own private file storage. Only administrators can review other’s files. I am very interested in this add-on, because I have several client sites that would like a few users (“Editors”) to be able to upload files that would then be available to all “Registered” users. Your description says “by default the files are kept private”. Does this mean there is a setting to allow them to be visible to other users? If I buy the pack filebase Pro includes customer area? or buy the extension of area customers able to use without having to buy all the full pack? if I just want to put permissions to files for users who recommend? you need the Pro-version for a complete permission system. When you shall put the update ?? I’m about to lose a customer for this reason! At least tell me how I can do to set the font size of the letters in the files ?? in folders looks good, as in your photo this website but the file is large and can not find in the css as do the smaller font! I urge much! What do you think about this? Would this be possible soon? Play here free online duck life and experienced to level up the system click here and get the link to play it and get unlimited fun an amazing http://ducklife.xyz this one is type of sport game that makes the training montage actual game.